New TV partners have joined in broadcasting the CL Final all over the world for an estimated 5 million viewers following it live. Vienna, 22nd May 2009 – The 2008/09 season of the Men’s EHF Champions League is in its Final phase. The most prestigious club trophy in handball will be decided between two absolute top teams, German THW Kiel and Spanish Ciudad Real. The first leg will be played in the Sparkassen Arena of Kiel on 24 May at 18:45 hours and the winner will be crowned a week later in Ciudad Real on 31 May 2009. The Final will be a real highlight of the Champions League season. The two teams have played the Final a year ago and those matches were also of an extremely high quality full of excitement and spectacular action. Both Kiel and Ciudad Real have won their respective national championships with reassuring performances and they both showed a brilliant performance throughout the season. Kiel will have a chance to take revenge for the trophy that the Spanish lifted a year ago on German soil. On the other hand, the title holders are determined to claim their third title after 2006 and 2008. Both venues of the Final will be sold out, which is a strong signal of the enthusiasm of the local fans. However, the Final will also be watched live by an estimated 5 million people all over the world on the 21 different channels broadcasting. The interest in Europe as well as on other continents is palpable. In cooperation with the partner of the EHF Marketing, The Sportsman Media Group, new TV partners have joined in to broadcast the THW Kiel vs BM Ciudad Real game live in the US, Israel and in over 40 countries in Africa. ESPN360.com will provide top level handball to the US market online. The website will be available for viewers in the US and also on the territories of the Commonwealth. Pay-TV Sport 1 and Sport 2 will broadcast the game in Israel, which will be the premier of the event in the country. Setanta Africa has also joined in to air the game on vast territories of Africa. Sports friends and handball fans from 46 Sub-Saharan countries such as Nigeria, Cameroon, Ghana and Kenya will have the chance to experience top handball live. 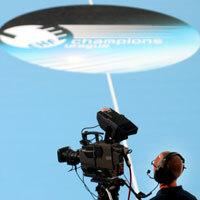 The EHF Champions League partner Eurosport will also dedicate abundant coverage time for the Final game. Eurosport 2, reaching over 30 million households in 46 European countries, and Eurosport Asia, available in another 14 countries in the Pacific region, will broadcast the game delayed. The web platform of the European Handball Federation, ehfTV.com operating on a free of charge basis, will show the game live. The broadcast will be geo-blocked in countries where TV coverage is already available, at the same time, ehfTV.com will offer English language commentary. The fans can watch games, highlights, interviews and magazine programmes on ehfTV.com as well video interviews from Kiel posted on the website. The 2008/09 Men’s and Women’s CL season has shown further increase in the number of TV viewers and the top club handball competition has confirmed its place on the market. EHF Marketing has been working closely together with its TV partners on new agreements for the upcoming seasons. TV deals in Croatia, France, Germany and Poland are currently being negotiated.